2012 myths and wacky claims debunked by a real expert, know doubt the nut jobs will think this is yet another government cover story. While events in Linden were commanding public attention, the National Toshaos Council Conference was held in Georgetown between August 6 and August 10. In previous years it has generated greater public interest because there was no news on the scale of the troubles in the mining town to obscure its proceedings. This year, however, not a great deal emerged about it, although last week, the Region 7 Toshaos released a statement relating to their concerns about the way in which it was conducted, while Toshao Solomon Lewis of Kurutuku subsequently had some comments to make on the subject as well. Here is a collection of articles, radio programs, and videos on E. R. Braithwaite. it also contains the two movies: “To Sir With Love” (1967) and “To Sir With Love 2″(1996). His life sounds like an implausible Hollywood script: Black youth seeks fortune in foreign land; gets teaching job in tough white neighbourhood… then turns his experiences into a bestselling book and a blockbuster movie. Note: Recipes from the Guyana Outpost Website were no longer available for some time, as the site was closed. 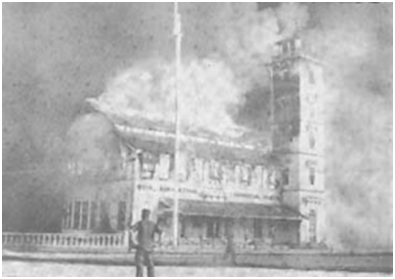 As people jumped up in the streets on Mashramani, they probably did not realize that in addition to being the thirtieth anniversary of Guyana’s advent to republican status, the day also marked the fifty-fifth anniversary of possibly the most destructive fire in Georgetown’s history. On February 23, 1945, the Great Fire, as it came to be known, devastated the commercial heart of the capital, and consumed a host of historical and architectural gems which had given the city its aesthetic flair. In addition, it laid waste the RA&CS building and its unique collection of books and papers pertaining to the past of this country.